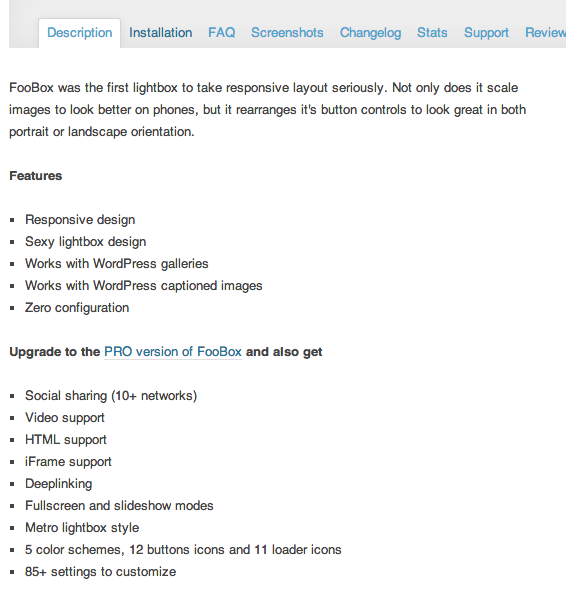 We recently released a free version of FooBox on the WordPress plugin repository. Let’s talk about those two things a bit more in depth. After that, I’ll share some initial statistical proof to back up my claim of the benefits of releasing code for free below. Giving back to the community by releasing a free plugin is a form of relationship building. In our community, it’s not only the right thing to do, it’s an integral part of a good software business marketing plan. When I talk about relationships I’m specifically referring to relationships with members of the software community that our products are made for. In the case of FooBox Free and our other free plugins, it’s the WordPress community. All of our plugins, both free and paid, are Open Source and released under the GPLv3 license. In short, this license gives users the freedom to be able to view, modify, and redistribute the source code of our software. Even the source code of our paid versions. Even though we charge a fee for our premium plugin versions, the spirit of Open Source still applies. Our fee is not for the source code, but rather for access to continued updates and access to support. This is best explained in the FAQ section of the GPL. By releasing free plugins on the WordPress plugin repository, we do our part in continuing to foster that spirit of Open Source, help other WordPress users by providing useful tools for their websites, and connect with them and other developers. Another reason for releasing a free plugin is simple. To get our brand name in front of millions of users. Providing a free plugin and having it listed in the WordPress plugin directory gives you direct access to your target user base with very low risk on their part. You’re essentially creating a “trial period” for your premium software, with your branding attached, and with the added opportunity to promote your Pro version that includes more advanced features, a promise of more regular updates, and access to guaranteed support. Yes, there’s a golden opportunity for marketing a paid product within the listing of your free software, but don’t be simply an opportunist. You must provide real value. There’s nothing wrong with letting people know there’s another version of your software that you charge for, but you should think hard about making sure that the free plugin you’re listing in the WordPress directory is actually useful. If there’s any hesitation in receiving a “Yes” from that voice in your head, then you should probably rethink what you’re providing in your free plugin. Let’s talk some more about the marketing opportunities. Now that your free plugin is listed in the WordPress plugin repository and has the potential to be seen by millions of people, the first opportunity you have to promote a premium version is front and center in the plugin description tab. The description tab is loaded first and the content there typically describes what the plugin is used for and the available features. The key here is to also use that area to let people know you have a premium version available and to list the features and benefits. You can see how we do it in the image below. 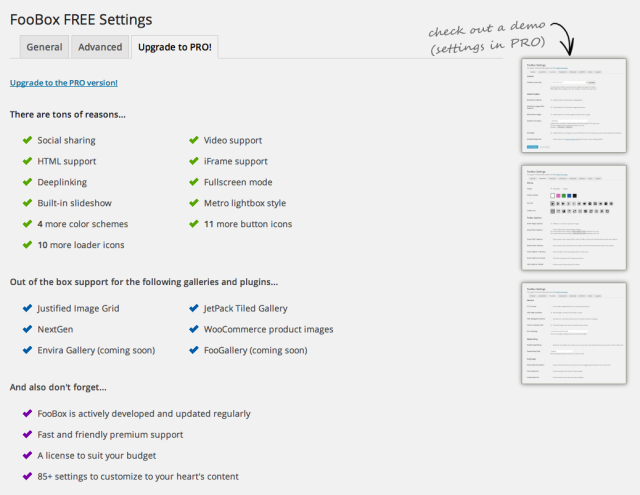 Another method to promote your premium plugin is within the plugin itself. There are a few ways to do this. Anything from a simple text link, to a notification bar nag, or even banner images. In the case of FooBox Free, we opted to create a Pro Tab within the settings page that includes a list of features available only with the Full version of FooBox. The tab layout matched our existing settings, so it’s non-intrusive. 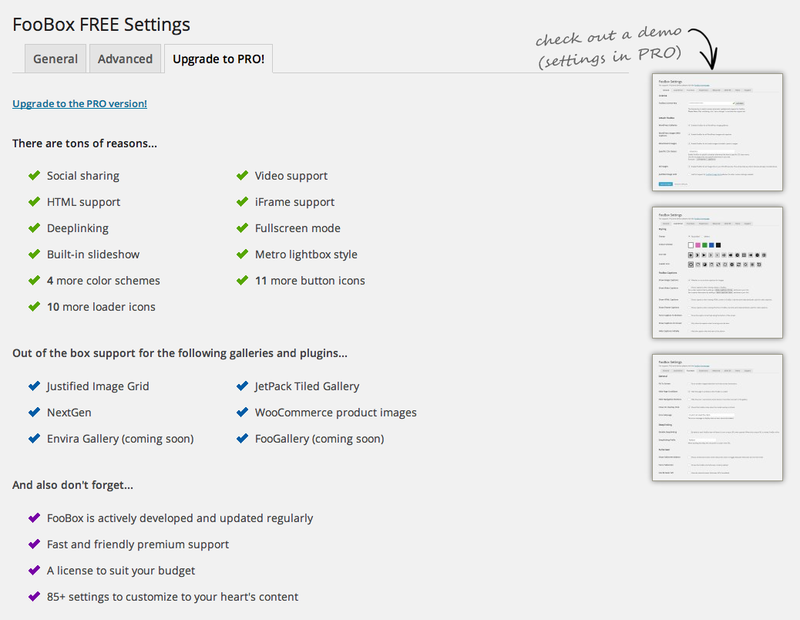 So, now you have people clicking through from two sources to learn more about your premium plugin version. But we wanted to know more about these click-throughs and how many people were actually visiting our FooBox Pro landing page, and from what links. In order to track visits from those links, and to determine which source was sending more traffic, we built a couple of custom campaign URLs containing extra parameters that tell us the source of that visit within our Google Analytics account. I wrote a detailed tutorial over on the WP Valet showing how you can do the same using Google’s URL Builder tool. Is our free plugin listing on WordPress.org driving traffic to our premium plugin? The results below are based on 7 days worth of data since FooBox Free was listed. We know people are visiting, but how many of those visits turned converted into actual sales? Tracking visits that convert to sales is still data collection that I’m setting up with Goals in Google Analytics, so I don’t have hard numbers to share just yet. I can say that it seems like sales have been up in the past 7 days, but with the way sales tend to fluctuate from week to week normally, that’s the best I can report right now. Now it’s your turn. If you’re a developer with free and paid versions of your plugin, what’s been your experience?